Check out this great new Google Maps Street View section on Camvista Google Maps, Live English Premiership Football Google Maps Street Views Virtual Stadium Tour. With Camvista constantly updating our Live Google Maps Street View Sections and always on the look out for new Google Street Views we decided to check out some of the English Premiership Football Stadiums that were available on Google Maps. The results were great! We found that Google Maps have recently updated some of their Football Stadium Street Views and realized that now you can actually take a Virtual Tour round the pitch on some of the English Premiership Football Stadiums. 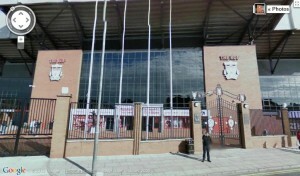 Check out some of these amazing Live Google Maps Street View Virtual English Premiership Stadium Tours on Camvista.com! Actually walk round the pitch and enjoy the Live Google Maps Street Views from inside the Stadium with Live Chelsea F.C Stamford Bridge Google Maps Street View and Tottenham Hotspur F.C Live White Hart Lane Google Street View Virtual Stadium Tour. But the most impressive Google Maps Live Stadium Virtual Tour is the City of Manchester Live Google Maps Street View Virtual Manchester City Stadium Tour. On this Google Maps Stadium Tour you can walk round the pitch and enjoy Live Google Maps Street Views during pre-match warm up before a big game. 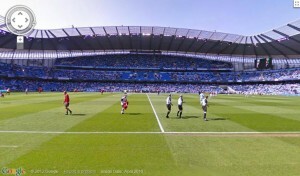 Watch the Google Street Views of The City of Manchester Stadium moments before a game. Check out the Manchester City Players warming up and the crowd arriving to their seats in this amazing Live Google Maps Street View English Premiership Football Stadiums Virtual Stadium Tour. Check out loads of Live Google Maps Street View Virtual English Premiership Stadium Tours with Camvista Google Maps Street Views. With Google Maps Street Views becoming more and more popular, Camvista are always looking for new and interesting Live Google Maps Street Views from all over the world. With over a hundred Google Maps Street Views we are always updating out Live Google Street Views. Keep up to date with Camvista Live Google Maps Street Views and check out the best Street Views from all over the world. Ties, socks, tankards and football shirts are some of the typical gifts given on Father’s Day, but are they what today’s web savvy dad wants? The answer is a resounding “no!”. What Dad will really want, although he may not know it yet, is HIS street name gifted to them from Streetdaq.co.uk, the newly launched UK virtual street deed trading web site – Streetdaq.co.uk – Buy a virtual street deed name on Streetdaq.co.uk for Dad as a gift for Fathers Day!!! If you had been a bit quicker looking for a Fathers Day gift for YOUR Dad you could have bought your dad Anfield Road, home of Liverpool football club, if he’s a Liverpool fan; or Leicester Square, if he’s a film buff. Alas, despite only being launched last Friday (5 June 2010) these locations have already been snapped up, but you could make a bid for them. Better news though if your dad’s a Cheryl Cole fan – and let’s face it a lot of men are or she wouldn’t have been voted world’s sexiest woman for the second year running by the readers of FHM magazine this year. There are lots of Cole Streets, Cole Lanes and Cole Roads still available. Streets are sold at Streetdaq.co.uk on a first-come-first-serve basis and any street deed is only ever sold to one person but can then be traded to other members for a profit. So you better hurry up and BUY Dad’s favourite street name for a Fathers Day present that Dad will really love and enjoy owning on the Streetdaq virtual street deed community exchange!!! With over 1.9 million street deeds available around the UK there are plenty to choose from, but the founders of the site recommend buying now before it is too late. “People that don’t buy now will be disappointed later just as those who missed out on snapping up the choice domain names on the internet for a bargain in the early days and sold them for a tidy profit later,” says Charlie Littlejohn, managing director, Streetdaq.co.uk. As well as potentially making a good profit when you sell a virtual street deed on Streetdaq you can also generate a good monthly income while you own it. One way is by forwarding the URL of your deed to friends and family via email and social sites like Bebo, Facebook, MySpace and Twitter. If one of them buys a new street on Streetdaq via your referrer link within 24 hours you automatically receive £1 paid into your Paypal account for every street deed that they buy. Camvista.com are now expected to challenge the current Liverpool FC owners, American Business Tycoons Tom Hicks and George Gillet, present day owners of the world famous Liverpool Football Club, to start packing their bags for a one way boat trip or flight back across the Atlantic. “As new owners of Anfield Road, home to Liverpool Football giants Liverpool FC, on the Streetdaq Virtual Street Deed Trading Exchange, we’ll be hoping to raise much needed finance to renovate the current Anfield football stadium on Anfield Road to a 80,000 all seater state-of-the-art football stadium rather than the present US owners stadium plans at Stanley Park.